It almost sounds interesting, doesn’t it – nice shiny surface, good quality card stock, if you are lucky – but what about the pictures and writing you don’t want? How do you cover that up? So here is the fun part, using this online system you can create greeting cards with any images you like including your own photos, and you can write whatever messages you like as well. There are thousands of stock cards to choose from, but a blank card is as blank as a blank document, and you can add writing in different fonts and colours, backgrounds, images, photos, even clip art, and create something totally unique. Each card is created individually, stuffed into an envelope and sent to the recipient from the printers in Salt Lake City for you, so it’s a great tool for last minute cards and gifts, and you can even send cards from an app on your phone. I’ve been using this online system to make greeting cards for about 5 years, and a few months ago I realized the shiny, good quality card stock made a great dashboard surface to stick things on. So I made some ‘greeting cards’ which I sent myself so that I could use them as dashboards, and it was a resounding success. To design my dashboards I took a blank card template, and added the design I wanted. The two smaller dashboards in my photos are the front and back of one greeting card, so I got even more of a bargain on that one, and when the card arrived I just cut it along the fold, scored each side down the middle, and folded each one in half. Then they slip onto one of my TN elastics easily. It’s a little wider than Field Notes size. 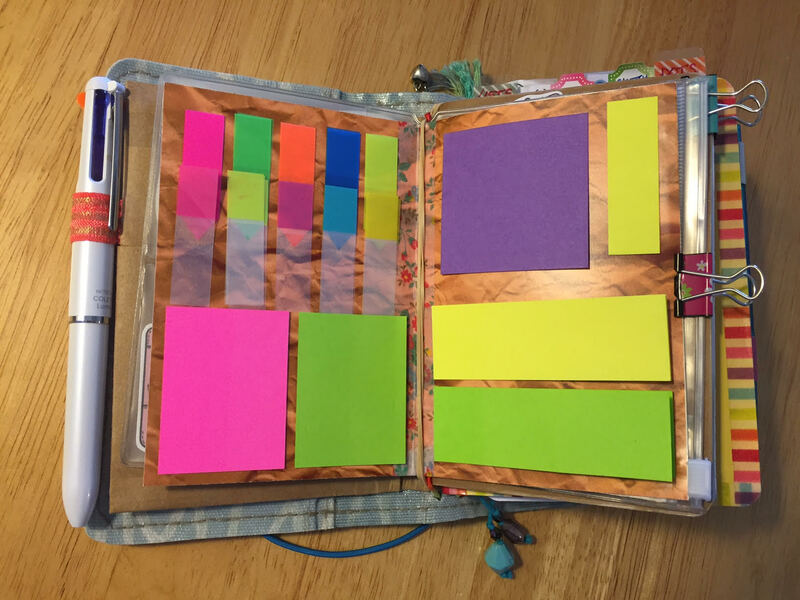 Then I figured I might not want the dashboards to be that small, so I could use a whole card and trim it down if necessary, and you see in the photo, the larger one, which I just popped in the back of a notebook, I trimmed to fit. These greeting cards are standardly 5″ x 7″, but you can also get 8.5 x 11, and that covers just about any size of planner you might have. The price is really low too – a standard 5” x 7” card costs $1.66 including postage. Now you might be wondering what happens at the back of the card as most greeting cards are white with the designer info and the publisher’s logo on the back and my dashboards have a design on them. Well, the greeting card system I use allows me to customize the back of the card with whatever I want, as well as the rest of the card, so I can play with all four sides which allows me total freedom in my design. This is so that if businesses send greeting cards out, they can use their own company branding on the back rather than someone else’s. For travelers notebooks it is important that you get a fold in your dashboard, but for ring or disc bound planners it does not matter at all, so you just cut along the fold and punch your holes where you want them. As I write, my imagination is running away with me – what if you created the design of the dashboard with a tab which you could then cut out? How useful would that be? I’d like to offer readers of Carie’s wonderful Paper Planning Magazine a free greeting card dashboard of their own design. If you want to try the system out for yourself and do not mind having a standard white back with the SendOutCards logo on it, this is what you have to do to get your dashboard. You can send all your information to me at andreakoochin@gmail.com and if you have any questions at all feel free to call me on 858-829-5226 and I can figure out how to help you get what you need.